A somewhat overdue drivers-eye view of the inaugral Cape 1,000km – hereafter to be know as The Cape Beast. Sitting alone in the St Andrew’s bar of The Lord Charles Hotel with a pizza and beer in front of me, it was impossible not reflect on what might have been. A handful of weeks back, lying in Constantiaberg hospital after crashing out of the Argus, I already knew my role in the Cape 1,000 would not be as a rider. But some part of me held onto the remote possibility that maybe I’d recover in time. My first 100km club ride back with the Wednesday group finally banished that notion. I survived, barely, and mostly by latching on to every wheel I was offered. By the end I was beyond exhausted – my legs were like jelly. Even if I’d felt stronger, the answer to whether I’d ride would still have been a resounding “no“. Sitting on the bike for four hours was tolerably uncomfortable, but 50 hours? Not a chance! But this wasn’t an evening to dwell on my own misfortune, riders and supporters were beginning to trickle in and we had an Audax to make happen. 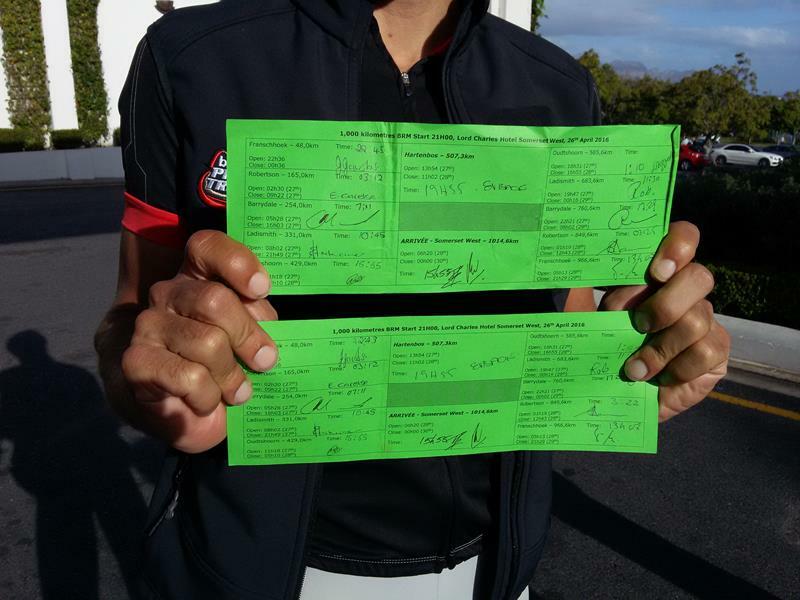 Riding, or helping out, all of us were there to take part in a little piece of Audax history – the first ever 1,000km BRM held in South Africa. I’m not sure it mattered that, through injury, other events, and general fear the number of starting riders had been whittled down to a final hardy nine. In some ways, having such a small group emphasized what a tough adventure this would be. 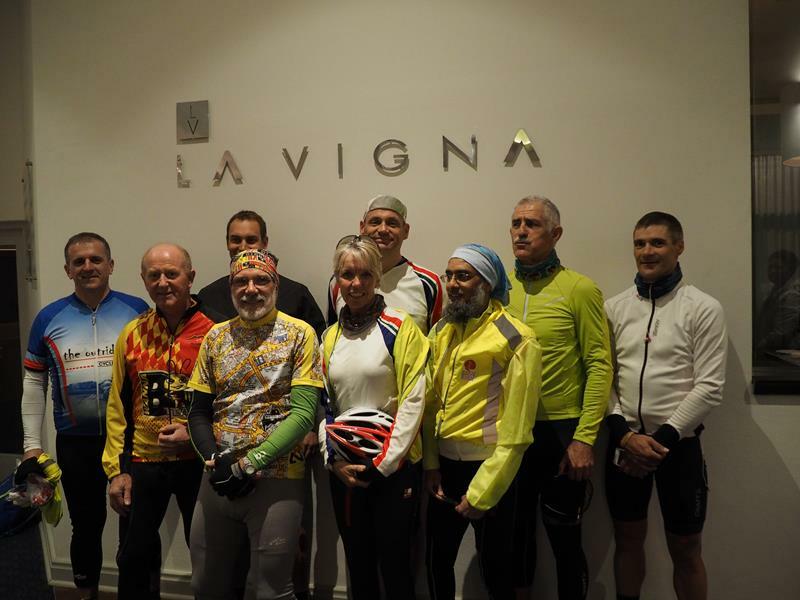 And not one of those gathered lacked the credentials for the challenge ahead – the lineup included thousands of kilometers of Randonneuring, several PBP Anciens, and our lone Ancienne Michelle (also with a LEJOG to her name). Only the hardiest should tackle such a ride, and that is exactly who stood in front of family, friends, and an impressive crowd of supporters. In the final few minutes before 9pm, along with the usual handing out of brevet cards came a less familiar ritual. I kitted out each rider with their SPOT Gen3 Tracker, and gave a brief run through of powering it up, starting it tracking, and under what circumstances to use the buttons. It didn’t really matter whether they remembered any of it. The batteries should last for days, so once stowed in jersey or bag, they wouldn’t need to touched for the duration of the ride. I don’t think any of us realized at that moment what a massive part these wonderful bits of technology would play in the ride. 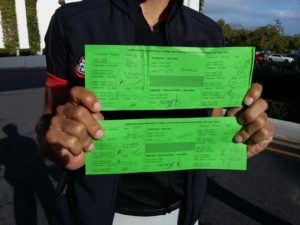 The remaining minutes ticked down on the clock, riders lined up in front of the hotel smiling nervously as cameras and phones flashed all around. The moment was here at last, and the air filled with the wonderful sound which those nine would be listening too for the next three days – spinning pedals and whirring hubs. They were off, disappearing down the hotel driveway out into the darkness, and the cold. Came a voice from over my shoulder, I think it was Sue. I forget my exact reply, but it was along the lines that there weren’t really words to sum up how much. There was, in fact, something of a lump in my throat as I packed up my stuff. Before leaving I bade farewell to Gerhard – safety driver for the “first shift“, which would last until around Thursday morning. We’d most likely pass each other somewhere out in the Klein Karoo on the R62 as I headed out for the second shift. I checked in on the tracking page a couple of times from home during the evening. Each time I saw very much what I’d expected: a leading group of two consisting of Wimpie van der Merwe and Chris van Zyl; the remaining riders sticking together in one following group (Nico Coetzee, Theunis Esterhuizen, Michelle Gahan, Henri Meier, Peter Muller, Salim Shaikee, Kenneth Wilson). Waking up on Wednesday morning though provided my first introduction to the game of “interpret the tracker“. You can, of course, see where everyone is – and has been, for the past few hours. What you can’t tell is why! 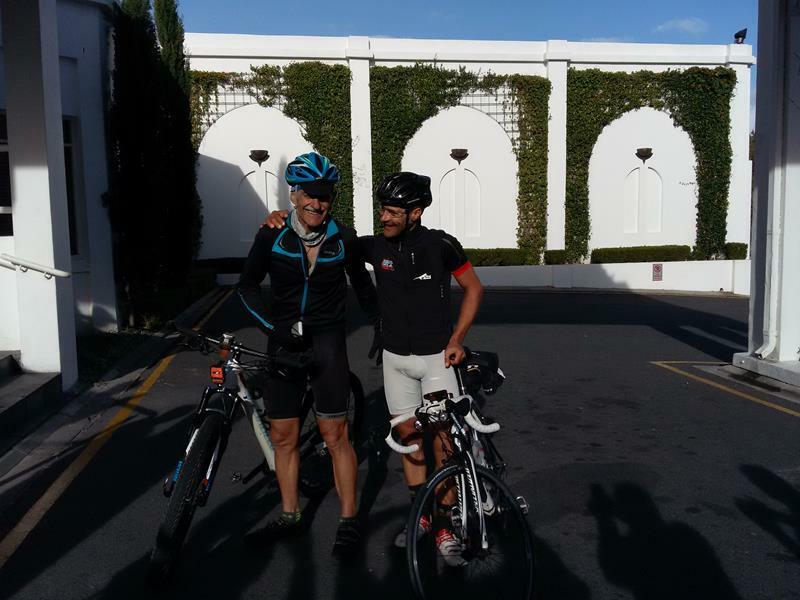 Peter and Kenneth’s trackers were still showing around Franschhoek (which they should have reached by midnight!) and Henri’s was back in Somerset West. With so many cycling accidents lately, it was a relief when Gerhard’s text filled in the rest of the story: the nighttime temperature had continued to fall, exacerbating Kenneth’s bad back and play havoc with Peter’s chest; and family matters had cut short Henri’s ride at Villiersdorp. The message also explained why Nico, normally one of the faster riders, was trailing behind the main group. He’d suffered an upset stomach and was battling sickness around Robertson. 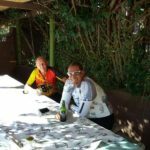 Given the severity, it was amazing he wasn’t further back – Michelle, Salim and Theunis were only around 20km ahead heading in to Montague. I remember saying a little prayer for him whilst sat in front of my screen – he could easily catch them if he recovered some strength. 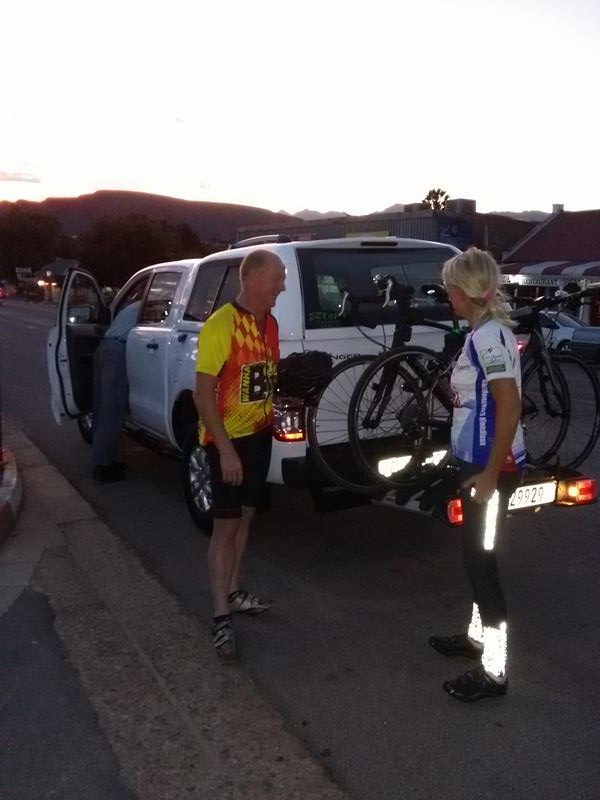 Wimpie and Chris, predictably, were blazing ahead – already in Barrydale around daybreak. Dot-watching and following Gerhard’s texts became borderline obsessive for the rest of that day. 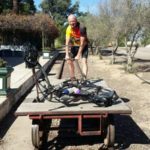 One thing we’d agreed was that Gerhard would send me a list and picture of eat set of drop bags as he deposited them at the various sleep stops (Barrydale, Calitzdorp, and Oudsthoorn) so that I’d know what to collect and from where on the return leg Friday morning. And sure enough, the photos came in with his messages – plus a snap of the entrance gate to the Calitzdorp Back-packers just to help me locate it. A thoughtful touch! Sat in our local Wang Thai on Wednesday evening, Yoli and Ben very kindly tolerated me checking in on the tracker page now and then from my phone. Secretly, I think they were also more than a little interested in keeping up with the riders. We could see that Chris and Wimpie were already on Robinson Pass and should reach Hartenbos that evening – a truly amazing performance. Theunis, Salim and Michelle were close to Calitzdorp, and no doubt would be looking forward to seeing a bed for a few hours. Nico was around Ladismith, now beginning to battle two foes and not just one – to add to his gastric unrest, time was also now working against him. Checking in a few times before bed that evening, the task ahead of him began to look alarmingly tough. Thursday morning was my turn for a shift at safety driver. 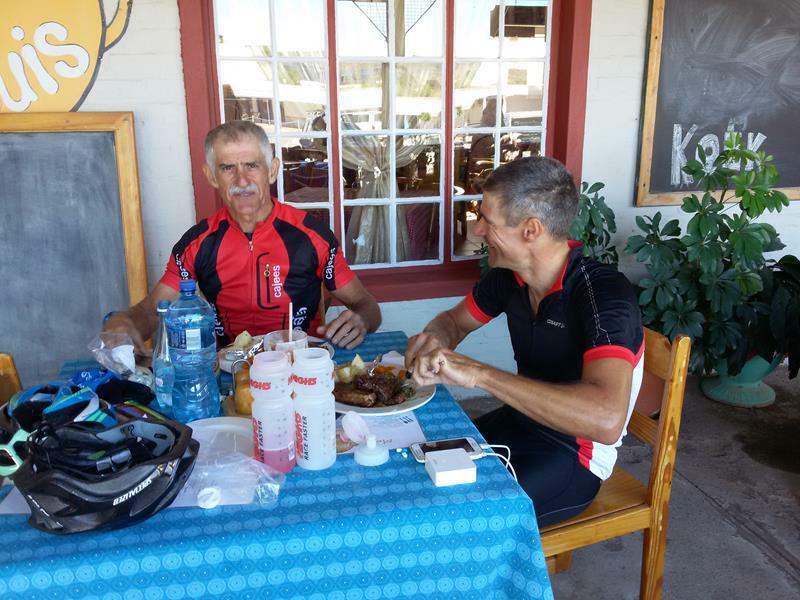 Gerhard had already headed home, so we wouldn’t be meeting each other out on the R62. 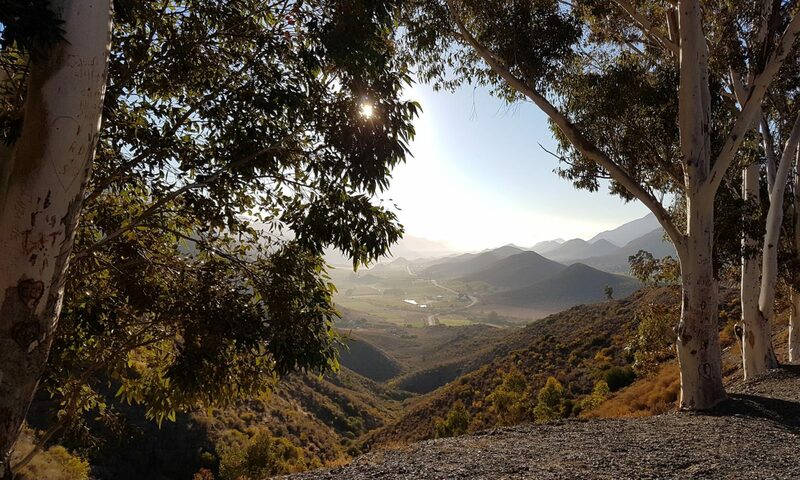 I got myself together as fast as possible, loaded bike rack, spares, tools, and water into the car and headed off – dropping Ben at school before beginning my trek up the N1 towards Swellendam, at which point I could cut through Tradouw pass to join the R62 at Barrydale. Before leaving a few messages had already been flying around from supporters struggling to interpret the trackers. My take, from a quick look earlier, was that Theunis had retired, as had Nico – although it looked as if he had soldiered on to Oudsthoorn before abandoning and turning back. Leaving just Salim and Michelle in the middle (now tail) group on the road. Except Michelle was not actually in the tail group, she wasn’t actually anywhere. Only later on did I notice the SMS from Charlie Murray (SPOT Africa) saying he could see Michelle’s batteries had died, but luckily I guessed this was the cause and had packed spares. Chris and Wimpie seemed to be bang on track, apparently stopped, as planned, for some sleep just outside Oudsthoorn on the return leg. With a quick mental calculation I figured our paths ought to intersect on the R62 somewhere around Ladismith. In Riviersonderend I stopped to relay a few messages on my interpretation of the tracking data, and Michelle’s absence – and asked Gerhard if he wouldn’t mind keeping the Facebook page updated with news, so I could concentrate on driving. Nico’s wife Valerida had also messaged and I did my best to put her mind at rest with my understanding of the situation. I also made the first of several notes to myself for future editions: safety car is a 2 person job, one driving and one free to man the phone/messages; and rides with increased interest need a liaison person/controller back at base to keep message boards, Facebook pages etc updated. Progress to Barrydale was remarkably quick and, with a car full of supplies, all I took was a quick pee stop before aiming the car down the road and into a truly glorious Klein Karoo morning. The sun was already heating the parched landscape, and to the right of the car a black eagle wheeled high on a thermal, silhouetted against a sky of pure blue. The view would have been all the more beautiful seen from a bicycle, but even from a car it wasn’t half bad. With little traffic and no queues at the Stop-Go roadworks, the 80km or so to Ladismith rapidly fell away. I cursed again not having a co-driver to check the tracker and see which side of the town Wimpie or Chris were, and instead fell back to manual tactics. Dropping my speed, I scanned the roadway ahead looking for two solitary cyclists. And then, just ahead on one of the last small rises before the town, I saw a sight which made my heart sink – the Flashing red lights of an ER24 ambulance. Just beyond, barely visible was the unmistakable outline of a bicycle wheel. Oh No! The worst of all possible outcomes. I dropped my speed and crept towards what I assumed was an accident site, praying that the downed rider wasn’t badly hurt, that it wasn’t Wimpie or Chris. And then I spotted another wheel, and another, and finally an entire peloton of wheels. Crikey, clearly this was a group ride which had been involved in some accident. Except, as I passed, there was no accident. I pulled over a safe distance away and ran back to see if they needed help. It was a big group out on a tour, from the UK if I recall, I’m not sure they even said what the medical condition was, but happily it wasn’t a fall or a crash. They moved out and passed me as one very large group. I dropped back, with just a couple of kilometers into town, there was no hurry now – a great sense of relief washed over me. No accident, and I’d soon get a chance to catch up with the lead guys. The first place I checked was Steers, but with no sign of bikes I swung right into the town and stopped at the Shell garage. Still no sign. Eventually I pulled out my phone and began zooming further and further into the tracking screen to get a more exact fix. Eventually, I was down to a few meters, but confusingly the screen said they were right next to me – or at least somewhere across the street. I looked up through my windscreen and, over the top of a bush, all but camouflaged from the road I spied Wimpie’s face grinning back at me. Talk about tracking – this little gizmo had quite literally pinpointed the cafe they were now sitting in enjoying breakfast. I dashed across the street to join them. Aside from clear signs of fatigue and lack of sleep, they seemed in good shape and didn’t really need much from me. I topped up their bidons with fresh, bottled water from the car – both seemed wary of the local tap water. I also grabbed a couple of quick snaps on theirs and my phones. The one spare Wimpie really needed, I was sadly unable to help with – his sunglasses had gone missing somewhere out on the road, and he was now battling glare and wind without protection. I sat a while whilst they hacked into a couple of massive chunks of meat and shared stories of a hair-raising ascent and descent of Robinson Pass, blasted by high winds around the summit. They’d also taken a short road-side nap somewhere on the pass, only to be woken by a passing motorist who stopped out of concern for their welfare – they hastily waved the Samaritan, keen to get back to sleep. With no more I could offer them, I was eager to get out to wherever Salim and Michelle were so I could fix her tracker. I bade the guys a good ride and pushed on. Having already warned Theunis I’d only stop in to meet them on the return leg, I made straight for Oudtshoorn with all the legal speed I could. It was a great relief to make the right turn onto the R328 just before the town, and head towards the pass. It wouldn’t be long before I saw Salim and Michelle. In fact, As it turned out, it was considerably further than I expected before I finally spied a cyclist, and not a duo as I’d hoped but the lone figure of Salim struggling up one of the rolling hills on the way back from the pass proper. He was clearly exhausted and labouring, suffering a Randonneurs condition I know all too well – a complete inability to do anything much apart from pedaling, especially string words together in a meaningful way. I took a long look at him, but physically he seemed fine, fatigue aside. He had plenty of food and water, and confirmed that he wanted to carry on. We weren’t at a control, so the only option I could offer him at that point was a lift home if he wanted to retire. He didn’t. He also confirmed that Michelle wasn’t far ahead – the only way I could have missed her was if she had already been in Oudsthoorn as I turned off onto the R328. I headed quickly back, wondering how on earth I would find her in such a big town without her tracker working. And then the obvious struck me – on such a long Audax, no Randonneur will go any further into a control town than they absolutely have too. So whatever the first cafe or gas station was, however ramshackle, that’s where she’d most likely be. The garage turned out to be pretty standard, not really that run down at all. But sure enough, as I crawled past in traffic, there propped against a railing was a bicycle, with Michelle sitting on the steps next to it. I quickly parked, jumped out and ran over to meet her. She seemed remarkable well – making good progress, in good spirits and not really in need of very much. We fished the tracker out of her jersey pocket and fixed the source of the problem. She had managed to find new batteries, but forgotten to push the “track” button, marked with a little footprint. Given the extreme fatigue of such a long event, it wasn’t really surprising. Soon after I started to get messages from people that they could see her tracks again. I suggested that she unload surplus weight at some stage along the road – perhaps Calitzdorp or Barrydale. With me now in support, she only needed to carry what was actually needed between controls. She agreed this seemed a good plan, and then rolled across the forecourt back out onto the R62, now making for home. I caught up on the tracker and messages for a few minutes, took the opportunity to fill up the car with fuel, and headed back myself. It wasn’t obvious how to support both Michelle and Salim now that they had split. I figured the best bet was probably to collect Wimpie and Chris’s drop bags from their B&B, and then join Theunis and Nico in Calitzdorp. From there I could keep an eye on Michelle and Salim’s progress, without hovering around bugging them, but still being close enough at hand should they need me. Michelle was already a few kilometers outside of Oudtshoorn when I passed her with a toot and a wave – she was head down though, battling what was now becoming an unwelcome headwind. The strong Northwester that had been forecast was picking up force. 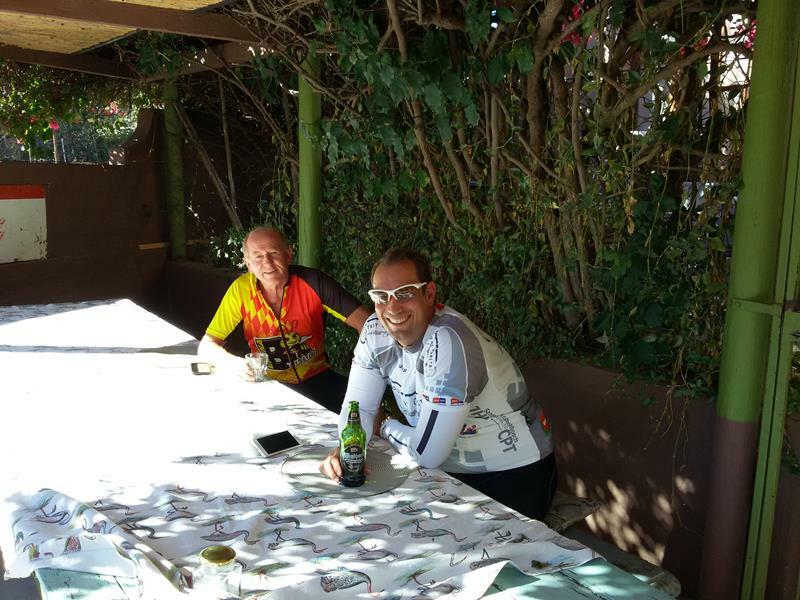 Added to that, the temperature was showing 30C – a hot and windy afternoon in the Karoo, just exactly what two cyclists with 600km in their legs would not have wished for. I felt for them, two lone, isolated dots slowly inching their way across this near desert, battling the elements with every turn of the pedal. It was heroic stuff – the stuff of fireside stories for years to come. I guess most would have been glad to be sat observing from the ease of the car, radio blaring and creature comforts close at hand. But I felt a twinge of sadness – this was a battle I’d love to have fought, a story I’d love to have taken part in. As painful and hard as this ride clearly was, I’d rather have been out there on a bike, one extra dot crawling across that map. The cafe in Calitzdorp where I met Theunis and Nico was already closing so, after a quick detour to pick-up bags from the charming old railway Backpackers (it really is an old railway, complete with tracks and trucks!) we took up residence at a quaint little Portugese restaurant at the edge of town. I was very glad for a break from drivin g, and a chance for a proper lunch rather than just road snacks. Conversation flowed, mostly about the varying fortunes and experiences of the guys on the ride. Nico’s had been downright traumatic, and prompted another mental note for future safety drivers: Rehydrate … and maybe toilet roll! Oh, and sunscreen, for those who forgot. There really is zero relief from the blazing Karoo sun on this route. Theunis’ tale was a sadly familiar one. At the time he had abandoned in Calitzdorp (380km) his legs and spirit were still strong, but his bum was in tatters again. His search continues for a workable saddle and/or body position that doesn’t shred his rear end. We chatted and chatted for what seemed like hours … only looking down at my phone did I realise that it was, actually hours. Michelle should have been here ages ago but before I could ponder going back to check on her an SMS came in. She’d activated the “Help” button on the tracker, and it had messaged me. I hurried back towards Oudsthoorn, hoping above all that she hadn’t suffered an accident of some kind. I continued some distance past her tracking location, but worryingly there was no cyclist to be seen on either side of the road. As I swung around to make another pass back and check in the ditches another SMS came in. An ambulance had stopped to check if she was alright and, on finding her to be fine, had given her a lift back into town. Phew! For the second time today, a wave of relief washed over me – all was well. By the time I got back to the little Portugese restaurant, Michelle was already there and recounting some of her stories from the ride. 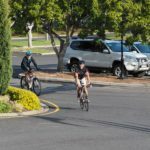 With over 600km of, using Michelle’s own words, the toughest Audax she had ever encountered the brutal headwind had sapped the last of her strength. 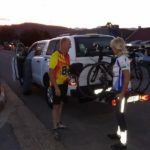 For 3 hours she had battled it, covering just 30km in that time, until finally she realised that there was simply no way she’d be able to continue like that for another 130km to the overnight stop in Barrydale. Retiring was a difficult, but inevitable decision. As the sun sank lower, our focus now shifted to two sets of dots on the tracking map. Up ahead, for some unknown reason, Wimpie and Chris were still soldiering along the 80km stretch from Ladismith to Barrydale. I had seen them at the start of that stretch around midday, so we assumed either a mechanical or the weather must have hit them. Normally they’d have covered that distance in under 3 hours. The other dot was Salim. Michelle was very concerned that he wasn’t eating and drinking enough and he was moving quite slowly. But he was making very definite progress towards us, and still had probably an hour or maybe more in hand over the cutoff time in Ladismith, 50km further along the road. I forget the exact sequence of events at this point. In some order, the sun set, Nico’s dad arrived to collect Theunis and Nico (my car having now run out of bike rack space for all the retirees), and Salim’s lights were seen rolling down the hill towards us. I’m pretty sure the last of those events was Salim’s arrival – he looked absolutely shattered. We helped him off his bike and into a chair. Whatever he decided to do from here, his immediate need was for food and some rest from the bike. Whilst he recovered the food Michelle and I had ordered arrived. Michelle’s face on seeing my plate had that unmistakable look of “darn, I wish I’d ordered that“. In front of me was without a doubt the most delicious plate of squid I have ever tasted – cooked in some form of stock, laced heavily with garlic, white wine, and just the perfect tang of lemon. Some day I will drive back to Calitzdrop with Yoli just so she can taste how good it was. In fact the whole experience in this delightful town had completely over-turned my impression from simply driving through. 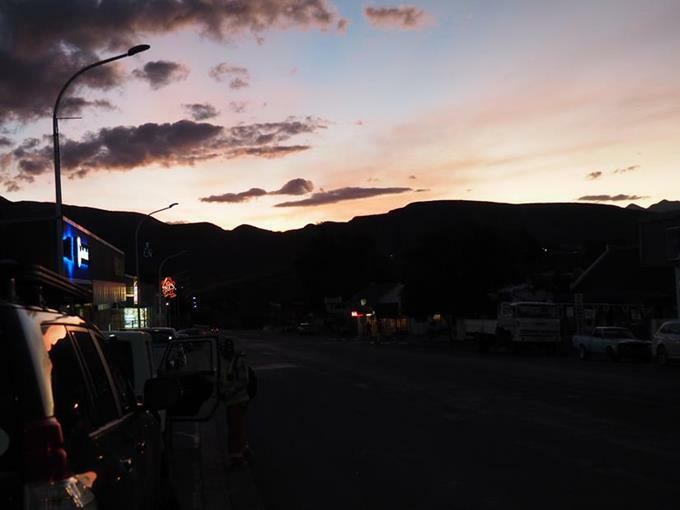 It’s a wonderful, hospitable little Karoo town which more than lives up to the reputation of the R62 as a tourist route. With food and a rest, Salim perked up noticeably. As with Michelle earlier, I really wanted to encourage him to push on – he still had time, and the wind had now dropped considerably. 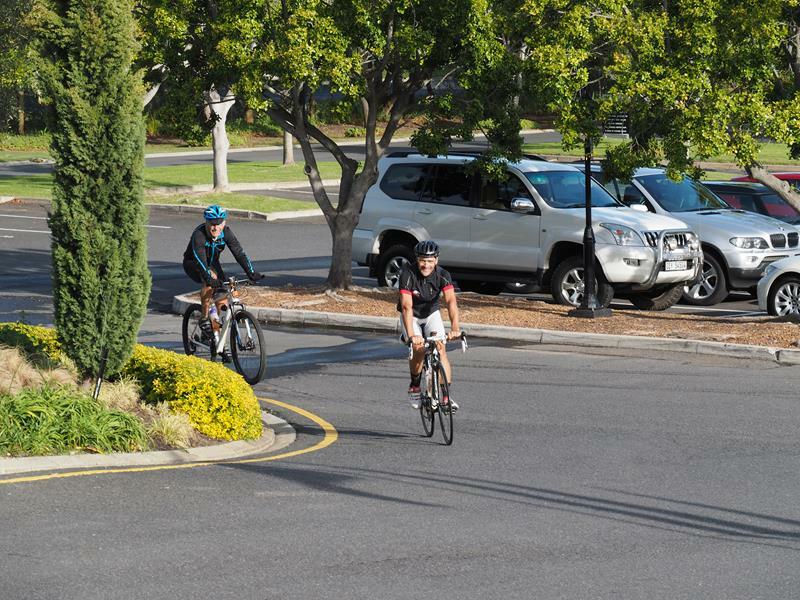 But he needed to make his own decision which, probably wisely, was to retire and take satisfaction both as the third to last rider standing, and also the completion of an extremely arduous 630km. 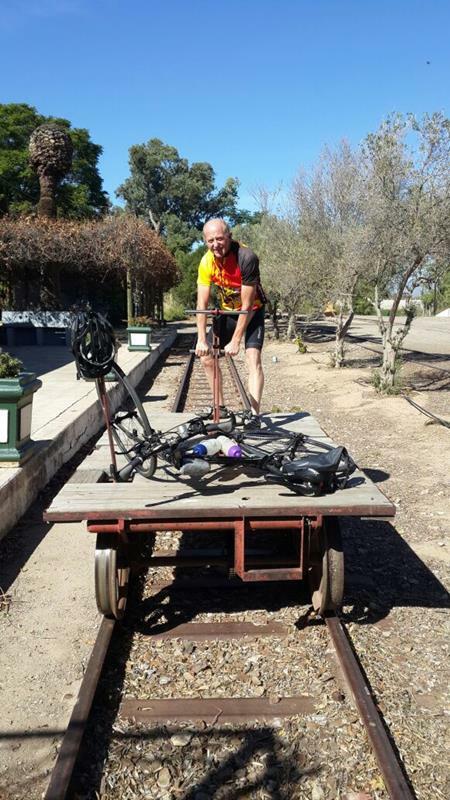 So, with nothing more to do be done, we paid the bill, loaded up the bikes, and headed back to Barrydale. All of us had rooms booked there for the night and, as much as I’d like to have got home that evening, it did make more sense to get some rest and start out early tomorrow. Salim was asleep before the car had begun to wind and climb up Huisrivier Pass. Michelle was still wide awake and we chatted a fair bit on the drive back – at some point she commented that her husband was loving the online tracking so much, he didn’t want her to go riding again without one. It had certainly made the job of being solo safety driver a whole lot easier throughout the day. Before long we pulled into the Barrydale Backpackers. We quickly confirmed the time to meet and head out the day after, and I drove the short distance into town for my B&B. It was now past ten and the house looked dark and silent. Fortunately, I had swapped messages with the owner regarding my late arrive, and he was there to let me in, waiting patiently whilst I unloaded the bikes and parked them in his breakfast room. In answer to his unasked question I explained that whilst I was sure they’d be safe on the car, they weren’t my bikes and I’d rather not take the chance. A warm room, comfy bed, a peaceful night’s sleep, and a shower in the morning. The B&B had everything I needed for the few hours I was there – except bloody beskuit (I did in fact swear to myself)! I hadn’t expected breakfast at the unearthly hour I got up but the least they could have done was put a couple of beskuit out with the tea and coffee making facilities. And it was raining. I muttered and mumbled grumpily to myself as I loaded the bikes up under a steady drizzle which was now falling. I’m simply not a morning person until at least one cup of tea, a beskuit or two, and maybe a coffee chaser have woken me up properly. I poked around the surrounds of the backpackers whilst waiting for the guys, searching in vain for a cup of coffee. I spoke to a staff member going in to the cafe next door – but he wasn’t there to open up. Any hope of coffee and breakfast would have to wait for a stop along the road. The wind and rain lashed down as we made our way through the stunning Tradouw pass – the darkening storm and gloomy light if anything making it even more scenic. 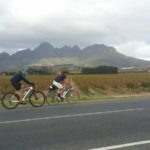 It was impossible not to think of the two guys still out on the road – they’d be slogging directly into this same storm somewhere around Montagu or Robertson by now. Even for riders of their strength, the outcome of the ride was beginning to look far less certain. We drove through occasional breaks in the storm, some with blue skies and sunshine, but behind each another front of strong wind and heavy rain came charging through. 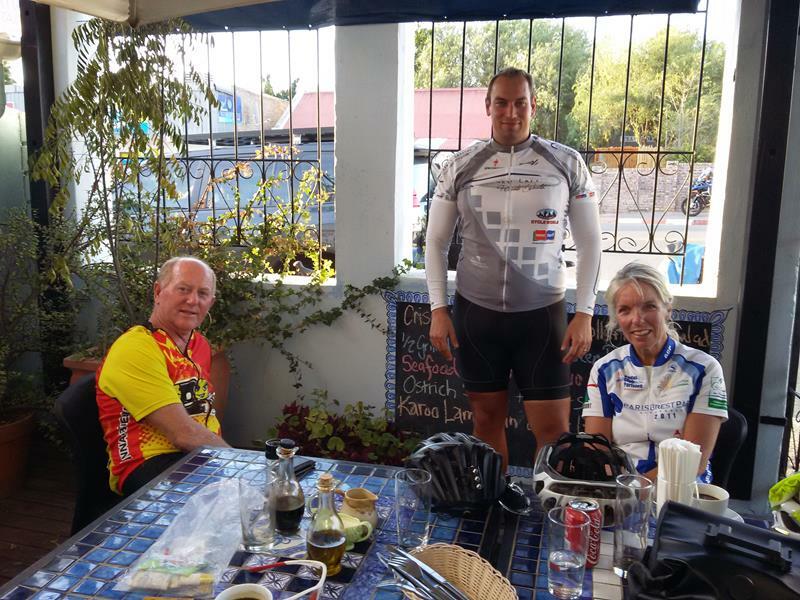 With just the briefest of stops for coffee in Riviersonderend, we were back in Somerset West by midday. I’d originally expected the guys to be almost home by now but with the harsh conditions, it was clear they still had hours left to ride. I really wanted to see them home though, and Yoli very graciously agreed to me traveling to our weekend break under my own steam later on so I could be part of the welcoming party. Their arrival was further delayed by a serious mechanical to Wimpie’s bike, but eventually word came through from Peter Muller that they had safely reached the control in Franschhoek. By now, SMS and WhatsApp messages were flying around from friends all over the world who were following their progress on the tracking page. Adding to those, we soon started to get pictures from Peter and others of our two brave warriors now, finally, with the finish in their sights. Eventually, at a little before 4pm on Friday 29th, we heard a faint cheer from down the driveway and glimpses of two, very weary riders, appeared through the line of trees. 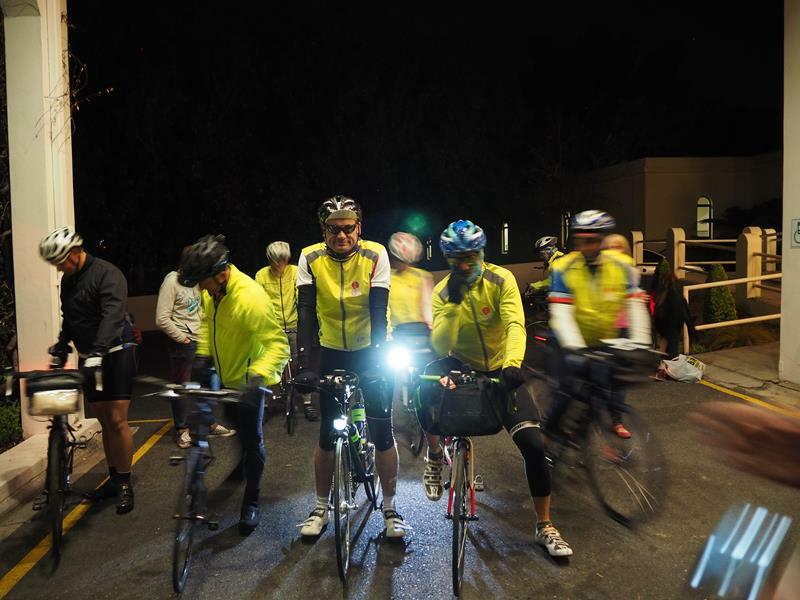 They rounded the last corner and rode up to the steps of the Lord Charles Hotel 66 hours and 55 minutes after they had left that same spot on Tuesday evening. I don’t think either of them would ever have imagined the ride could take them so long, but then I don’t think any of us ever imagined the route or the weather would be so merciless. 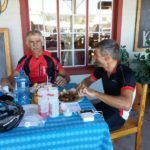 The clock didn’t matter though – Wimpie van der Merwe and Chris van Zyl became the first riders to complete a 1,000km BRM Audax in South Africa. With special thanks to the Lord Charles Hotel for their gracious hosting of our riders, and to SPOT Africa for the generous loan of the Gen3 tracking devices for each rider. They gave supporters across the globe a ringside seat to the unfolding drama. 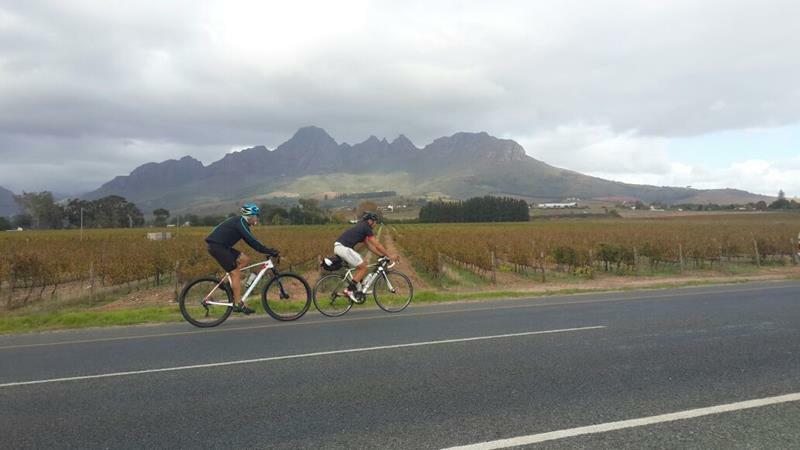 See Nico’s blog and the Audax SA site for more accounts and information on the Cape 1,000km. Lekker Rob. Thanks for organising. We’ll catch the next one.